Bright futures ahead as our students enjoy outstanding success in the IB Diploma. We are delighted to announce a superb set of results this year. With an average points score of 34 compared to a global average of 30 points, Beau Soleil students have set themselves well above the competition. Nowhere is this more evident than in the results of our two students who gained 43 points each, placing them in the top 1% of IB students globally. 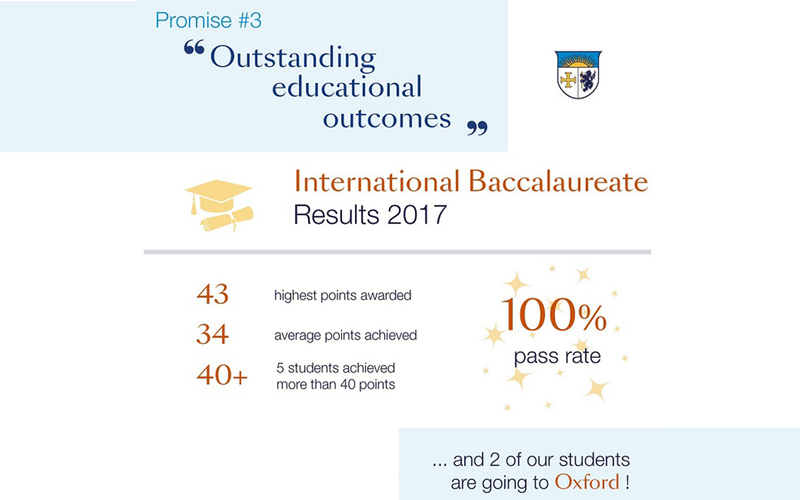 An impressive 20% of our IB graduates scored 40 or more points, compared to a world -wide figure of just 3.6%. The French Section of the school have also achieved some great results. 20 % of our Bac students attained Mentions and have secured places at leading universities around the world. From the Sorbonne to the University of Montreal, the University of London to Boston College the classe de Terminale can feel confident as they move into the next chapter of their education. We are proud of every one of our students: proud of their efforts, their determination, their resilience. Proud too, of our teachers who have helped these young men and women, supported and encouraged them on their journey. At Beau Soleil we work hard, as a family, to build not only academic success but also character and ambition: qualities we see reflected in these glowing results. Our Graduating students are well prepared for future success: 23% of the cohort will follow courses at World Top 50 universities, including Oxford, NYU, EPFL, King’s College, LSE and Edinburgh. As they embark on this next step, we wish them all the very best and hope that wherever they go in the world, they will always keep in touch with us, their Beau Soleil family.